It’s another morning. We need to get out the door. We’ve pulled together what we have in the fridge for breakfast. The house is a wreck. The children are falling apart. We’re under-slept and over-extended and just about to start pulling out our own hair (just so we don’t pull out each other’s). That was us. On Monday. Except that morning, instead of breaking out in arguments or badgering or tears, we broke out in song. Really silly Disney musical numbers, but with our own lyrics. And we all ended up laughing and starting the day with the best energy. Here at Sparkle we LOVE silly things. If you listen to our stories, you'll know they are filled with all sorts of humor and silliness. We wanted to share three of our best, laughter-inspiring games, to get your family laughing as well. 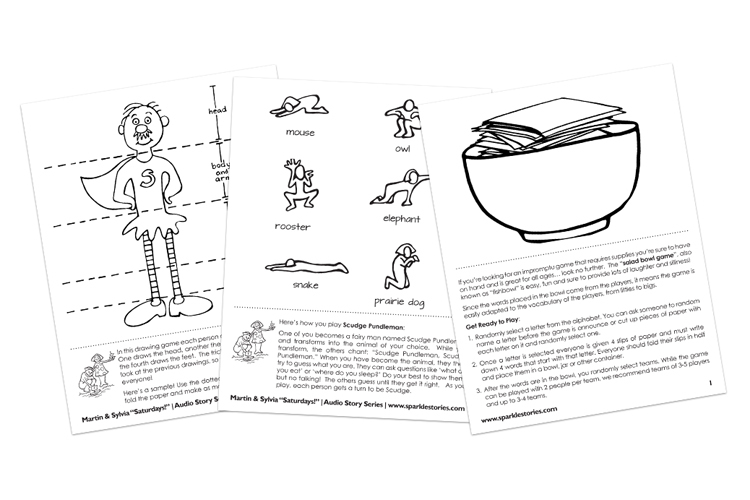 See all three below, and download the printables so you can have them handy when it's time to play. Scudge Pundleman is the name of a game that David came up with in a desperate-parenting-moment when our kids were 3 and 6. The children were a mess, and in a moment of brilliance (to which that good man is prone), he said, "Have you guys ever played Scudge Pundleman?" There was a great and amazed silence. As it turns out, Scudge Pundleman is a little like charades with a lot of kindergarten zoology thrown in. Scudge goes into the living room and becomes an animal, while the zoologists count to 20. They then march into the forest (or grassland or jungle) chanting "Scudge Pun-dle-man, Scudge Pun-dle-man". The animal, sometimes hidden or sleeping, is discovered, and the zoologists must try to deduce what kind of animal it is based on how it behaves and what it eats (it gets offered carrots, hot dogs, peanut butter, hay, you name it). This is yet another silly activity that David pulled out of his hat one day at a restaurant when our kids were being, well... young kids in a crowded restaurant. And it wasn't pretty. 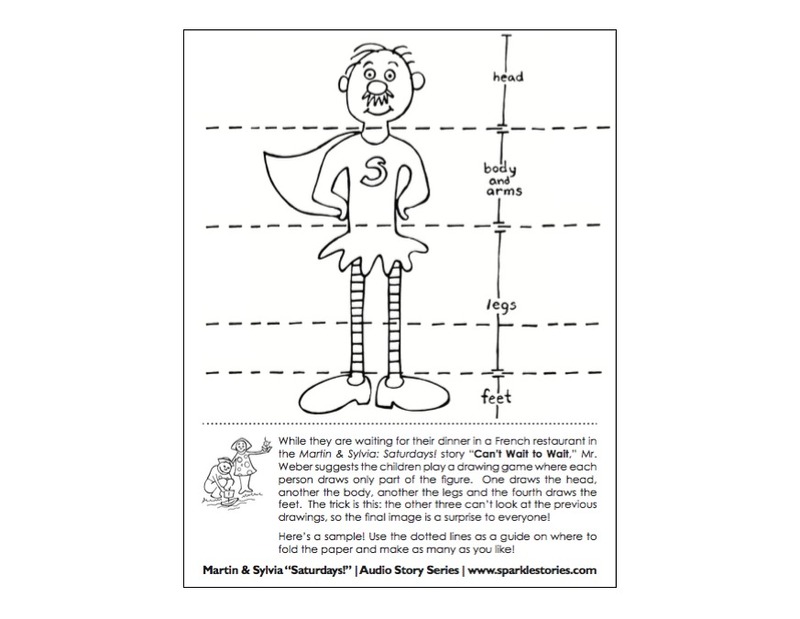 I believe David pulled out a napkin, drew the head of a character on the top of it, folded it in three so no one could see, and invited our older son to draw the body, and our younger to draw the legs. Everyone ended up laughing thoroughly at the final creature, once the paper was unfolded. And of course we had to play again, and again. This is, hands down, our family's very favorite game currently. If we have friends over for dinner, you can guarantee one of our kids will ask "Can we play One, Two, Three?" 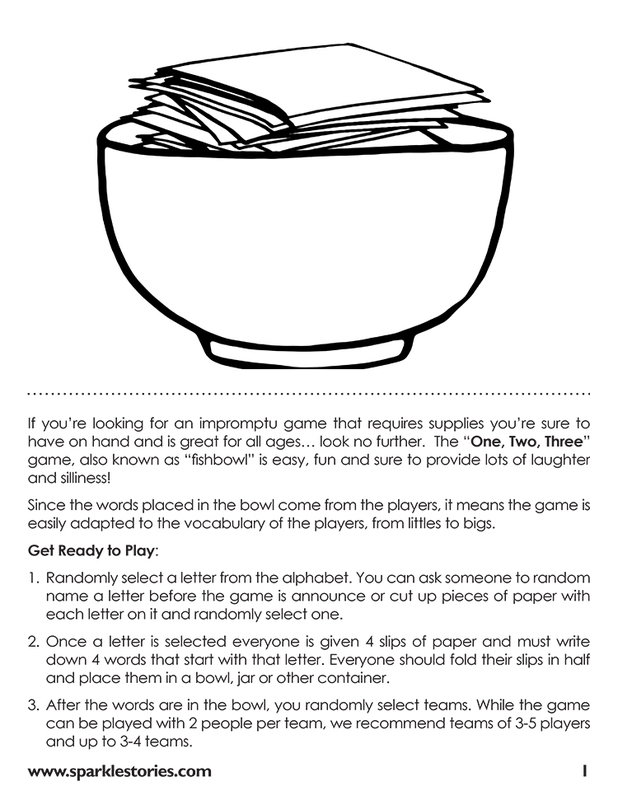 This game is also commonly called "Salad Bowl," and is so easy to play. All you need is a big bowl, paper and pens. This game has three rounds: the first is like the game "Catch Phrase," where you describe a word for teammates to guess, without using the actual word. 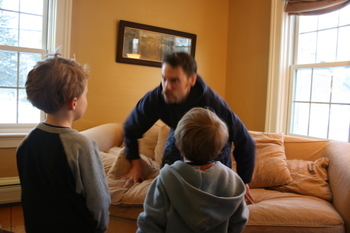 The second round is charades with the same clues, and in the third, the player can only give a single word, from which his teammates must guess the clue.